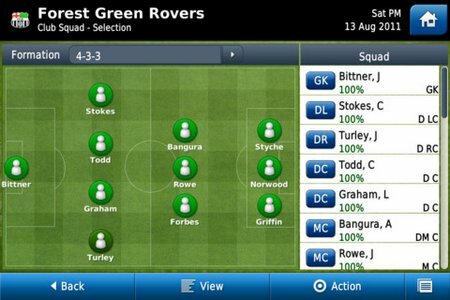 Some great news has just emerged from developer Sports Interactive, which is the maker of the famed, long-running Football Manager series. It’ll be launching the mobile version of the game for Android next week, with Football Manager Handheld set to launch on Wednesday April 11th. The game’s been available on iOS for quote some time, where it’s picked up the usual rave reviews we’ve come to expect from the world’s favourite footie management title. That’s the iOS version, to give you an idea. It’ll cost £6.99 on Android, but, we are reliably informed, is worth it, if you like football. Here’s a press release. Football Manager Handheld makes Android debut! LONDON (April 5th, 2012) – The world’s most popular sports management game is about to meet the world’s most popular mobile platform, as Sports Interactive and SEGA proudly announce the launch of Football Manager Handheld™ for Android on Wednesday, April 11th. 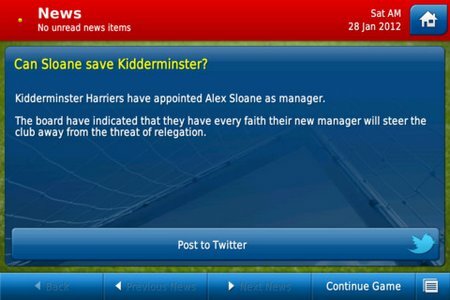 Football Manager Handheld, which is already a massive success on iPhone, iPad and iPod Touch, has been designed to bring all of the highs and lows of the greatest job on earth to mobile devices. Taking the hot-seat at any club from a choice of leagues in 12 countries, the player assumes full control of transfers, training, tactics and managing the team live during match-days – a job which can be tackled in either short, commute-sized sessions or in mammoth sittings on the sofa. The Android-equipped manager can choose to pursue an entire career in a particular country’s league or face up to the handheld-exclusive ‘Challenge Mode’ which offers a particular short-term scenario with a clear goal to be achieved. Whichever mode is chosen, the manager will deal with real-life situations involving real players, as researched by Sports Interactive’s huge global scouting network. Football Manager Handheld for Android will be initially be available through the Google Play store, priced at just £6.99. It is likely to become available through a variety of other Android app stores over the coming weeks. The 12 countries with playable leagues in Football Manager Handheld for Android are Australia, Belgium, Brazil, England, France, Germany, Holland, Italy, Portugal, Scotland, Spain and Wales. The game can be played in four languages; English, French, Italian and Spanish. Football Manager Handheld for Android has been designed for Android devices using OS 2.2 and above (please check on the Google Play store for a full list of compatible devices).